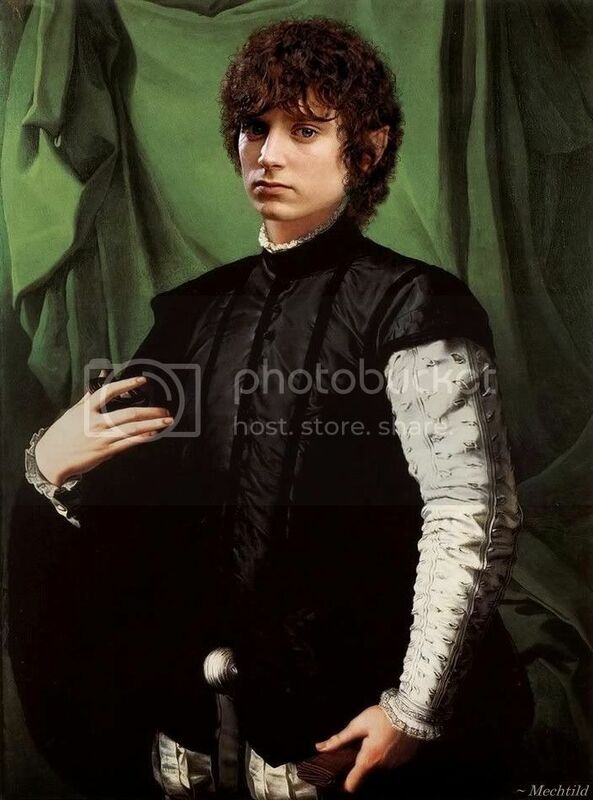 ~ Detail of Frodo as Agnolo Bronzino’s ‘Ludovico Capponi’. Warning: Very long post, more like a "mini-essay". Last night I was restless. I stayed up late and re-did a manip that had been bothering me. It had been made from another portrait by Agnolo Bronzino (1503—1572). 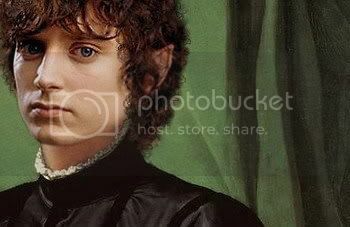 I had done it to indulge my pleasure in seeing Frodo in fancy dress. Here is a link to an image of the original portrait, Bronzino’s Ludovico Capponi, c. 1551. I sort of dashed this manip together, just for a giggle, but, when it was done I thought it had a really nice mood, and was sorry I hadn’t taken the time to do it properly. A year and a half later I have decided to do just that. Frodo’s face in this Frodo Art Travesty strongly evokes for me the writer of the poem, Frodos Dreme, properly called, The Sea-bell. This strange and melancholy poem is collected in Tolkien’s small volume, The Adventures of Tom Bombadil. I will quote it in full, below, and say a few things about it, something I have wanted to do for a while. Discussion of Frodo’s Dreme (or, The Sea-bell), and related matters. Tolkein wrote a preface for the Tom Bombadil collection, very droll. In it he submitted the poems to various forms of literary criticism in vogue at the time, assessing their genres, conjecturing as to who wrote them, when, and how they were passed down -- just as if they were real works of ancient literature discovered in a dusty under-used Oxford library. The Red Book contains a large number of verses (…) The present selection is taken from the older pieces, mainly concerned with legends and jests of the Shire at the end of the Third Age, that appear to have been made by Hobbits, especially by Bilbo and his friends, or their immediate descendants. Their authorship is, however, seldom indicated. Those outside the narrative are in various hands, and were probably written down from oral tradition. The verses, of hobbit origin, here presented have generally two features in common. They are fond of strange words, and of rhyming and metrical tricks – in their simplicity Hobbits evidently regarded such things as virtues or graces, though they were, no doubt, mere imitations of Elvish practices. They are also, at least on the surface, lighthearted or frivolous, though sometimes one may uneasily suspect that more is meant than meets the ear. No. 15 [The Sea-bell], certainly of hobbit origin, is an exception. It is the latest piece and belongs to the Fourth Age; but it is included here, because a hand has scrawled at its head "Frodos Dreme". That is remarkable, and though the piece is most unlikely to have been written by Frodo himself, the title shows that it was associated with the dark and despairing dreams which visited him in March and October during his last three years. But there were certainly other traditions concerning Hobbits that were taken by the ‘wandering-madness’, and if they ever returned, were afterwards queer and uncommunicable. The thought of the Sea was ever-present in the background of hobbit imagination; but fear of it and distrust of all Elvish lore, was the prevailing mood in the Shire at the end of the Third Age, and that mood was certainly not entirely dispelled by the events and changes with which that Age ended. Someone, he implies, who scrawled the name, "Frodo's Dreme," had associated the poem with Frodo and his times of darkness at the anniversaries. Who would that have been, in Tolkien's scenario? But, however much they cared for Frodo, neither Sam nor Frodo's other friends seemed to notice or understand what was amiss with Frodo, that is, of consequence. But Frodo had become adept at concealment. He honed the skill during the course of his ordeal as he struggled to keep his mind veiled from the Eye as long as he could. Besides, Merry and Pippin lived far off and Sam was gone a great deal. They simply didn't see Frodo at every moment of the day. As for the cousins, again, although there are some great fics depicting the cousins as deeply involved in Frodo's post-Quest life, worrying intensely over the state of his health, trying to find ways to help him, the text doesn’t suggest this picture. They just don't seem to know of Frodo's suffering. They are not shown as present for the anniversary illnesses, and Frodo seems to have successfully concealed it the rest of the time. And Frodo wasn't the sort who would burden his friends with his problems, anyway (if he could possibly help it). Merry and Pippin lived together for some time at Crickhollow, and there was much coming and going between Buckland and Bag End. The two young Travellers cut a great dash in the Shire with their songs and their tales and their finery, and their wonderful parties. ‘Lordly’ folk called them, meaning nothing but good; for it warmed all hearts to see them go riding by with their mail-shirts so bright and their shields so splendid, laughing and singing songs of far away; and if they were now large and magnificent, they were unchanged otherwise, unless they were indeed more fair-spoken and more jovial and full of merriment than ever before. Frodo and Sam, however, went back to ordinary attire, except that when there was need they both wore long grey cloaks, finely woven and clasped at the throat with beautiful brooches; and Mr. Frodo wore always a white jewel on a chain that he often would finger. All things now went well, with hope always of becoming still better; and Sam was as busy and as full of delight as even a hobbit could wish. Nothing for him marred that whole year, except for some vague anxiety about his master. Frodo dropped quietly out of all the doings of the Shire, and Sam was pained to notice how little honour he had in his own country. Few people knew or wanted to know about his deeds and adventures; their admiration and respect were given mostly to Mr. Meriadoc and Mr. Peregrin and (if Sam had known it) to himself. Also in the autumn there appeared a shadow of old troubles. The very next paragraph shows Sam coming upon Frodo in the study as he suffers pangs in his shoulder and is seized by dark memories. Sam notices and asks Frodo what is wrong. It is only afterwards that Sam remembers that it is Oct. 6. At the next anniversay illness, in March of 1421, Frodo was able “with a great effort” to conceal it from Sam. “For Sam had other things to think about” – Rosie was almost due with their first child, born on the anniversary of the destruction of the Ring. But things seem to proceed as before. Frodo was writing, and conferred convivially with Sam on the naming of is new daughter. In the fall Frodo suggests to Sam the trip, introducing it with the topic of Bilbo's coming birthday. It would be nice to see the old hobbit again (but Frodo never explicitly says they will be going to Rivendell). Surely Sam knew where they were really going when they rode away, but perhaps he did not. The text leaves it open to each readers' conjectures. Again, the "Grey Havens" chapter presented a picture of a Frodo whose illness was not easily perceived by others. By many, not at all. Yet he did suffer; he suffered enough to leave the land and people he loved so well behind. in its dead leaves, bare were its boughs. My own opinion is that the poem was developed from something Tolkien had started, perhaps decades before, for Eärendil, later reworking it for Frodo. Some scholars have wondered if it didn't express Tolkien's own dark moods, which could come upon him in his later life. I find that a very interesting notion, since it makes more explicit an imaginative link between Tolkien and his suffering but ennobled protagonist. In a key story of the First Age, Eärendil, on behalf of the beleaguered remnant of Men and Elves in Beleriand, sails over the Sea with the Silmaril (retrieved through desperate courage by his wife and companion, Elwing), in order to plead for the help of the Valar. When he finally arrives on the shores of Aman, he walks alone to the city of the Elves. He finds its streets deserted. Tirion is empty as he climbs the high hill. He does not know it, but it is a time of festival in Valimar. … His heart was heavy, for he feared some evil had come even to the Blessed Realm. He walked the deserted ways of Tirion, and the dust on his raiment and his shoes was a dust of diamonds, and he shone and he glistened as he climbed the long white stairs. And he called aloud in many tongues, both of Elves and Men, but there were none to answer him. Therefore he turned back at last towards the sea…. Eärendil is brought back to feast in Valimar and treated with honour. His quest has not been in vain; Beleriand will be rescued. But, as a mortal who has set foot in the Undying Lands, he must stay there. He cannot return to his homeland. So he sails his ship across the sky with the Silmaril bound to his brow, the Evening star, the hope of those the still oppressed by evil. Elwing waits for him at the end of every crossing of the sky, since she has not been made to survive such heights. As a seabird, she wings up in joy to meet him as his ship comes to haven. I see an awful lot of resonance between these two iconic Tolkien characters, Frodo and Eärendil. Both were rescuers of their people at the cost of not getting to live out their lives with their own people in their own homelands, but who then become a light to their people, those who yet dwelled in [Middle-]earth. So, I don’t think it at all odd that Tolkien should have reworked something begun as a poem about Eärendil into something for Frodo. In fact, in my fanfic imagination, I imagine Frodo finding this poem about Eärendil’s voyage to Aman, unfinished, interleaved among the papers and books he brought back from Rivendell, to work from for his and Bilbo's history. I imagine him trying to "tidy" it, then begin to work on it, or it to work on him. The first part seems to be more solidly about Eärendil, but, as it proceeds, his own experience seems to bleed through, staining the poem darker and darker until it is the recounting of extreme feelings of alienation. Like Eärendil, he walks through empty, silent streets; he calls but there is no answer. But no voice breaks the silence, welcoming him or bidding him come and be received in joy, as was Eärendil. To emphasise the contrast, I post again the poem's ending. Knowing the story of Eärendil comforts me. When I read this poem and remember the story which it recalls, it gives me a sense of light at the end of the dark tunnel that is Frodos Dreme, even if Frodo (when he was experiencing these terrible times and writing about it) could not see then see it. Frodo may not be able to go home again, but, like Eärendil, he will be lifted up by the Great as a guiding light. Not just to Middle-earth but to earth-dwellers through the ages who find themselves living in dark times, whether in themselves or in the world. And his small, true light will illuminate their minds, fire their spirits, and burn in their hearts. Gazing at the sleeping, wounded Frodo in Rivendell, Gandalf noted a “hint of transparency” in Frodo. He remarked to himself, “He is not half through it yet, and to what he will come in the end not even Elrond can foretell. Not to evil, I think. He may become like a glass filled with a clear light for eyes to see that can. Frodo Baggins: the Evenstar of his people. I love the lighting on his face. What a wonderful post, Mechtild. You've left my head full of inspiration. Today is my writing day and this is just what I needed. If I caused you to be inspired, it was all worth it, Igraine, you are such a gifted writer. Frodo’s pensive look gets me every time. It’s a dangerous business falling for such perfect beauty. Oh I can’t help it, so I must live with it. That was a wonderful essay Mechtild very thought provoking. I have never read that poem before. It is so terribly melancholy to me and it hits me even more how Frodo must have suffered. Thank Eru it is only fiction I would not want anyone to suffer in that way. I'm so glad you liked the manip, Este. Yes, the face is very beautiful. As for the melancholy poem, well, you can always say Frodo never thought those things in the poem, since Tolkien himself, as the tongue-in-cheek writer of his preface would not come out and clearly say Frodo had done so. But, when I read it for the very first time, I felt a moment of recognition. I haven't been able to shake the poem since, "hearing" it when I read of Frodo's last year in the Shire. Interesting essay - and very plausible. I've always loved this poem. It is decidedly 'hobbity' though dark, and I can see Tolkien reworking it for Frodo too. He had lots of repeating themes in his work. Hey, angst is your department (well, it's a lot of people's "department"s). Yes, the fingers. 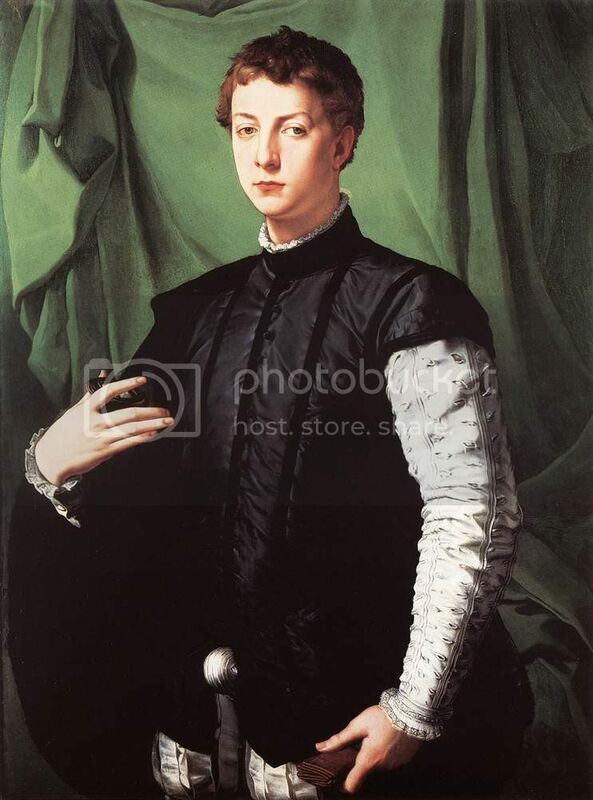 Bronzino did the other portrait in which you pointed out the hands, super-long, tapered fingers. It must have been a social necessity in those days. I browsed through a lot of portraits of the period by other artists, and such hands were so common in them, I decided that the subjects must have openly or implicitly insisted on being depicted with them. Sort of like people now wanting to be made to look slimmer. "Frodo may not be able to go home again, but, like Earendil, he will be lifted up by the Great as a guiding light. Not just to Middle-earth but to earth-dwellers through the ages who find themselves living in dark times, whether in themselves or in the world. And his small, true light will illuminate their minds, fire their spirits, and burn in their hearts"
I feel I should quote Gandalf here ~ "And that is an encouraging thought". But to be honest, I feel more like quoting Sam ~ "I don't know why, but it makes me sad". Whatever Frodo's ultimate fate was when he sailed into the West, I will never get over the fact that he was unable to stay in his beloved Shire - it breaks my heart. Er yes ... its me again - I didn't really intend to repeat myself there - I obviously didn't read the preview carefully enough!!! Frodo may not be able to go home again, but, like Earendil, he will be lifted up by the Great as a guiding light. Not just to Middle-earth but to earth-dwellers through the ages who find themselves living in dark times, whether in themselves or in the world. And his small, true light will illuminate their minds, fire their spirits, and burn in their hearts. Wow. That's incredibly powerful, Mechtild. I tried to bring this same theme into my story "Sing Me Home", where the Elves saw in Frodo a light and Presence they were dumbfounded to learn that Frodo's own people couldn't perceive. They were honored to receive him, and make him welcome in the West "as one of them". He is forever a part of the Great Music of Arda, for ears to hear as choose to listen. I tried to bring this same theme into my story "Sing Me Home", where the Elves saw in Frodo a light and Presence they were dumbfounded to learn that Frodo's own people couldn't perceive. They were honored to receive him, and make him welcome in the West "as one of them". He is forever a part of the Great Music of Arda, for ears to hear as choose to listen. Yes, the Elves did see that light, but they had it, too. Because they had it themselves, it really is more reasonable that they would recognize it in another. I think "the light" in this sense is a way of Frodo's sort of "Elvishness" in the story, if subtley. The High Elves are seen to have a light about them. Where does it come from, this light? From their inner goodness? From what I read in LotR-related texts of drafts, and maybe I have remembered it wrongly, I thought the light that emanates from the High Elves is reflected light, from having lived in Valinor (i.e. in the presence of the divine) before the light of the two trees, the source of the purest light in Middle-earth. "Holy" light, if you will. I love that you brought in the related theme of "music" that runs through the stories of Arda. I have read some other fics that lift up Frodo's "song" and how it fits [beautifully] in with the celestial melody. The image moves me very much. Beautiful manip! I always found Bronzino's portraits intense and fascinating, and they match perfectly Frodo's beauty. Thank you for your very interesting essay. I was glad to read that very moving poem, which I didn't know. But the end is so sad! Poor Frodo! Ooh ooh! Isn't that a Bronzino's Lucrezia in your icon? Que bella! He has such melancholy beauty in this manip. 'Frodo's Dreme' is an incredible poem. Knocked me for six first time I read it. Wow! A happy ending for Frodo would not have worked. I would love to see Frodo happy, but the book would not be the memorable, beautiful, painful fairytale it is without the sound of the waves on the shore (echoing in Sam's heart and our hearts). The evenstar of his people. And yes, I always saw that inner light in him as Elvish. Definitely. Once again, I reflect on the perfection of Frolijah's casting. I'm so with you, Pearl. I find myself constantly marvelling at how on earth this back then 18, or 20 year old lad can have all these emotions of Tolkien's poem in his face and his eyes. Mechtild, it was a very good decision to re-do this manip. Your skills have improved mightily. With its bittersweet impression the picture is far more than just plain beautiful. This post is so intense, Mechtild! The visual part is intense with Frodo’s face that conveys the presence of deep feelings and strong experiences. And the mini-essay had touched a subject that are currently challenging my curiosity and stirring my imagination: Frodo Dreme. I think Frodo is a strong symbol of personal growing, and this poem shows it. I’m attracted by this poem like a magnet because it seems to contain one of the interpretations of the whole Frodo’s drama. I found Frodo Dreme only one year ago because its was published only recently here. The fist time I read it I didn’t understand the meaning but I felt a very strong emotion. It sounded so Frodo-like, but also so Tolkien-like. You make some very interesting points: Sam’s role and his family, Frodo’s loneliness, and particularly the similarities between Frodo and Earendil stories. Frodo and Earendil, both rescuers of their people at the cost of living out their lives with their own people in their own homelands, but who then become a light to the peoples, the mortals who yet dwell on [Middle-]earth. I agree completely with you, but I think the similarity is quite complete. Frodo and Earendil stories follow the same path, which is the double sea crossing. Frodo Dreme tell us of the first trip, that is Earendil sailing over the Sea with the Silmaril in order to plead for the help of the Valar, and that is Frodo’s departure to the quest with the Ring in order to destroy it. They both think they respective quest is a failure: Earendil found no living soul and heard no answer to his shouts; Frodo thought he couldn’t destroy the Ring. Both their quest has not been in vain: Earendil is brought back to feast in Valimar and treated with honour and Beleriand will be rescued; Frodo the Ringbearer become one of the wise of Middle-earth that will be rescued because of his apparent failure. In Frodo Dreme there is a second trip through the sea, just as in Frodo and Earendil stories. Earendil as a mortal who has set foot in the Undying Lands, he must stay there. He cannot return to his homeland. So he sails his ship across the sky with the Silmaril bound to his brow, the Evening star, the hope of those the still oppressed by evil. Frodo dropped quietly out of all the doings of the Shire, and Sam was pained to notice how little honour he had in his own country. Few People knew or wanted to know about his deeds and adventures. A brilliant star is an indication, a direction signal. Frodo is similarly an indication, an (unacknowledged) example for the growing of both hobbit and Men: he is the Evenstar of his people. I think the difference between Frodo and Earendil quests mostly consists in the reader’s perception of their story end . We know that Earendil sailed across the sky and all Middle-earth people can see him. We know that Frodo sailed to the West but Tolkien didn’t tell us anything else. Frodo Dreme ends where Tolkien’s tale ends. To myself I talk; for still they speak not, men that I meet. Frodo IS the Evenstar of his people, but we can see his brilliancy only by recognizing him as a symbol of our growing. He talks to himself because the men that he meets don’t speak with him. Thas is the sadness of Frodo Dreme. Sorry, Mechtild, for the length of my post, but your clever essay triggered a lot of ideas. Thank you for such a thoughtful past, Estelanui! I should have been clearer. Within the confines of the story, Frodo is completely out of the picture at the end. How can he be a light to his people? He does not continue to be seen like Earendil did. But he was seen in his story, which was left to his friends and heirs, through Sam -- the Red Book which contained his tale. For those who hear or read his tale, his light still is seen. My last two years on Tolkien messagboards has let me know strongly that people everywhere love Frodo as a character, but also identify with him personally and deeply -- yes, especially if they are going through a lot of changes. He's like a role model for experiencing negative change with fortitude and grace, and positive change with a spirit of humility and grateful awe. Yes, he feels completely cut off. It isn't true, from the perspective of his friends who love him, but from Frodo's point of view in his dark nights of the soul, it seems absolutely true. I think the poem conveys that sense strongly. Again, thanks for so many remarks of insight, Estelanui. I don't recall reading that poem all the way through or else I've seen parts of it before. I'll definitely read it again, in the morning, with coffee. Then I need to go back and read your BB Mountain posts. The semester ended just this Thursday and I have until the 15th, when classes start again. Alot of catching up and a short time to do it. I think what draws so many of us to fanfiction is the desire to see Sam and or the cousins at least recognizing Frodo's pain, even if they are unable to help. The text is so painful for me at that point, because like them I hoped he would be somehow find his place, after all he had been through I'm sure they expected Frodo to be fine. The brutal truth is the world goes on, I've lost loved ones and felt as if I were in the world of the Sea Bell where no one can reach you. I can't imagine what it must of been like for Frodo to experience that consistantly with no other hope of escape but leaving his home and all he loved. I love your thoughts on the light within Frodo, have you had a chance to read Splintered Light? I think your thoughts about what motivates writers to "raise the awareness" of Frodo's friends in fanfics is probably correct. I am guilty myself at times of not paying attention to loved ones who do very well maintaining, saying "I'm fine," when they are not, simply because they seem ok enough, I'm busy, and I want to believe they really are fine. That is true enough, sadly. I own a copy of Splintered Light. I LOVE that book. In fact, I just loaned it to someone using our library (I work there), since our system doesn't own it. He came in looking for sources, since he was working on a Tolkien research paper. Unfortunately, he just returned it with an apologetic face. He said bashfully that he didn't really understand what she was trying to say. I think Flieger's thoughts about Tolkien's use of words and images was just too involved and perhaps too scholarly for him. He literally could not tell what she was getting at. He showed me the books that had helped him and they were a lot simpler, more focussed on Tolkien's big, basic themes, with sketches of the characters and some biographical background and things like that. Good books, but far more accessible books. You are supposed to be RESTING! But thank your for the gracious, feeling comment. I, too, think his inner light is one of grace and holiness, that he is sanctified and lifted up by what he does - and that he *must* leave, though it breaks my heart, for the story to be *true*. Like you, I read it, was devastated, and immediately re read the entirety. Just now I am writing a post-Quest ficlet, and this and some music that semyaza just shared with me, help sustain 'being there' with him. I have come, over many decades, only to begin to understand Frodo and what has happened to one who has seen things that no other mortal (nor Maiar or Elf) ever saw or bore. He has become one of the Wise - and how can we go back to the Shire 'when we have seen Paree...' - or the great mysteries beyond mortal ken. Dear Frodo. I have come, over many decades, only to begin to understand Frodo and what has happened to one who has seen things that no other mortal (nor Maiar or Elf) ever saw or bore. He has become one of the Wise - and how can we go back to the Shire 'when we have seen Paree...' - or the great mysteries beyond mortal ken. Without your having enlarged upon this, if I understand you correctly, this could not be over-stressed. When readers focus solely on Frodo's misery, especially his psychic misery, as the reason for his leaving, so that he needed to be healed, they overlook the other reason he was no longer fit in with the Shire. He had "grown" - even out-grown it. Thanks, Alyrthia. You are gracious. It's good to see you here!